Transcripts of the courtroom battle between Bethesda and Interplay have revealed that Bethesda is working on a secret "World of Warcraft type" MMOG, but the company is now scrambling to cover it up before anyone finds out too much. The two partial transcripts of the legal wrangling over the fate of the Fallout MMOG have been a bit dry but nonetheless interesting, revealing little insights into what the future might hold for Bethesda, Interplay and of course the still-mysterious Project V13. But there's even more meat on that bone: Apparently, buried somewhere in the 218 pages of court transcripts is information about another MMOG, thus far unannounced, currently in development. According to Duck and Cover, which published the previous transcript segments, the court documents show that Bethesda has been developing a secret World of Warcraft-type MMOG project since sometime in 2007. 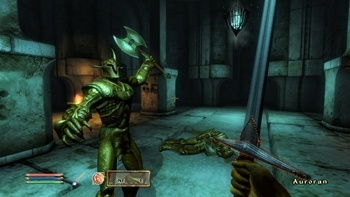 This would jibe with the August 2007 announcement of ZeniMax Online Studios, an MMOG division launched by Bethesda parent company ZeniMax Media with former Mythic Entertainment founder Matt Firor at the helm. The company has reportedly sunk "tens and tens of millions of dollars" into the game and has "close to a hundred people" working on it. VG247 claimed to be "reliably informed" that the MMOG in question is an Elder Scrolls game and was actually supposed to be announced last year. That doesn't sound entirely unlikely: Despite the success of Fallout 3, the Elder Scrolls remains Bethesda's flagship franchise and given the depth and breadth of the world already established, it would appear ready-made for the massively multiplayer treatment. Furthermore, it's hard to believe that anyone would sink that much time and money into a game without having the ironclad right to do so, yet the dispute over the Fallout 3 license is what brought Bethesda and Interplay before the court in the first place.